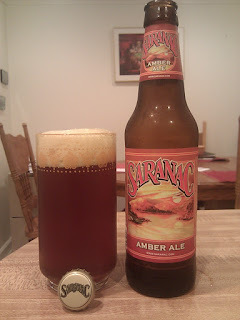 This is another review of a Saranac Beer brewed by Matt Brewing Company. Details on their brewery and other facts and lies can be found here. This amber ale hits the scales at a respectable 5.6% ABV, so if you start popping these suckers back around a campfire, sooner or later, you might end up in it like my friend Stinky. It's got a thick, malty taste like most ambers, which makes sense since they use two types of malts, honey and extra dark crystal. This amber ale is a little more bitter than I'm used to in an amber. Their chosen hops are Cascade (the same used in their IPA) and Fuggle, not to be confused with Fraggle. This gives it a pinier, more floral, citrus taste to the beer opposed to a thick, sweet malty beer. The aroma itself is a sweet as James Taylor; well, maybe not THAT sweet. Maybe more like Roy Orbison in his early years, which is still sweet. You can notice a caramel odor to it and a mild, medium bodied flavor. Amber ales are some of my favorites and this one is a little too bitter for the likes of me. It was part of a six flavor sampler and it definitely compliments what Matt Brewery can do and contrasts the flavors of their other beers. For amber ales, I might look somewhere else but you can certainly say that for the price ($13.99 for a 12 pack) a couple amber beers in the bunch is a fantastic contrast to the rest of them. In conclusion, a great addition to the sampler, but not something I would want to drink a case of. that photo looks nothing like the stinky i know!